Riding Club Champions of Great Britain ! 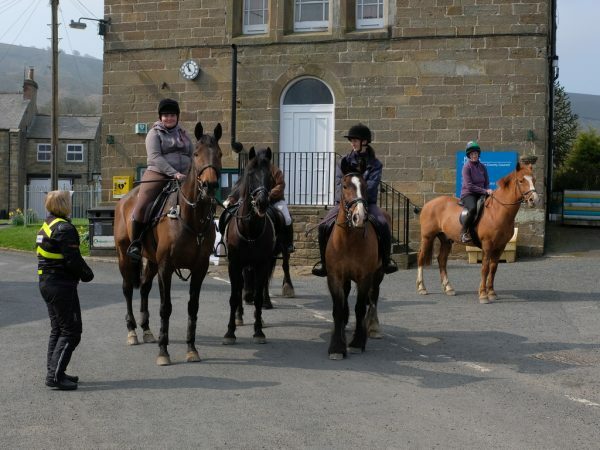 North Ryedale’s team was led by Pat Anderson riding her own, homebred Starlight Temptress, Vicki Seller riding Marbles, Kayleigh Marwood riding Aurburn Rattle and Jen Foster riding Ryemanor Iroco. All who live in the Rosedale Abbey area of the North Yorkshire Moors. Hartpury Equine College hosted the Riding Club Novice Indoor Showjumping Championships on Saturday 30th/Sunday 31st March. 29 teams from all over Great Britain took part, after qualifying at regional level. North Ryedale qualified out of 26 teams from area 4 at Bishop Burton after a fierce jump off in October 2012. Pat, the veteran member of the team at 66yrs, jumped a beautiful double clear, setting the standard for the 3 younger members, whose ages when combined only make 65!! Having finished the first round on a zero score along with another 9 teams, all was to play for in the second round. Vicki jumping first went clear, followed by Kayleigh who unfortunately tipped the last fence. The pressure was on. Pat once again performed a foot perfect round which left full pressure on Jen Foster and her reserve novice horse to pull it out of the bag! With only 3 scores to count, a final clear round was the only option for Jen. Luckily everything went to plan, leaving North Ryedale with the first zero score, proving too much pressure for the other teams, leaving North Ryedale the outright winners! The EquestrianClearance.com Riding Club Novice Winter Indoor Showjumping Champions!! On Sunday North Ryedale’s junior team narrowly missed out on the Junior title coming 2nd. We’d like to thank Fiona Foster and Ann Sibsey who kept everyone organised beforehand and throughout the competition. It couldn’t have been done without their hard work and dedication!